Marian Hossa plays Right Wing for the 2013 Stanley Cup Champion Chicago Blackhawks. Per the traditions of the National Hockey League (NHL), each member of the Cup winning team gets to spend a day with the Stanley Cup in their home town and use it for nearly any purpose. Marian chose to have his mother prepare her Slovakian dish, "Bryndzové Pirohy", which are delicious pierogies-crescent-shaped dumplings filled with salty "Bryndza"(sheep cheese). And what better way to serve and eat this family favorite? 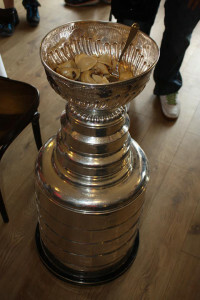 How about right in the bowl of the Stanley Cup trophy! Sorry. You'll need to get this information from Mrs. Hossa in Slovakia.